NEW: Airlines ground more flights as Sandy strikes Northeastern U.S.
Have you been affected by Sandy? If so, share your images and footage with CNN iReport, but please stay safe. (CNN) -- Airlines around the world canceled flights to and from the northeast United States as a massive storm slammed into the coast of New Jersey and New York. 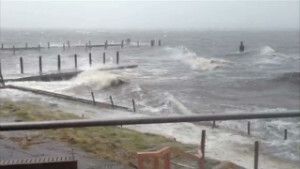 Hurricane Sandy, now rated as a "post-tropical" superstorm, forced the closure of New York's JFK and LaGuardia airports and Newark in New Jersey "until further notice" as rising flood waters washed across parts of the city, while domestic and international flights were canceled at other major airports in the region. Middle Eastern, European, Asian and U.S. airlines prepared to take a financial hit, with the weather stranding their passengers in cities across the globe. "Every day this goes on you're seeing combined losses to the airlines of roughly $10 million," said Simon Calder, travel editor of the UK's The Independent newspaper. "The cost is actually much worse for European airlines like British Airways and Virgin Atlantic, because they have to pay for accommodation and meals for their customers who are stuck in the U.S. -- particularly in New York." European Union law says airlines have a "duty of care" to take care of stranded passengers. There is no such law governing U.S. airlines. "Delta and United can just say, 'Sorry, this is a weather event and you're not covered,'" Calder told CNN. At least 50,000 travelers between the UK and U.S. have been affected by the storm, Calder estimates. In Asia, airlines grounded more flights as the extent of the storm became clear. Australia's Qantas, Korean Airlines and Japan's JAL canceled all New York-bound flights on Tuesday and Cathay Pacific said Wednesday's departures to JFK would also be scrubbed. With 11 flights canceled to and from New York, Washington D.C., Philadelphia and Baltimore, British Airways has offered to rebook flights for its passengers. A statement on BA's website said: "We understand that customers may be disappointed, however their safety is our highest priority." The airline's flights to and from Boston were expected to operate normally. Britain's Virgin Atlantic also canceled all flights to New York, but announced that flights to Washington and Boston were scheduled to begin again on Tuesday. More than 80 flights from London's Heathrow Airport to the U.S. East Coast were canceled, including 47 arrivals and 37 departures. Karen Mackenzie from Essex, in southeastern England, was planning to fly Monday to New York on a Virgin holiday package, but the airline canceled her entire holiday due to the storm. While Virgin Atlantic gave Mackenzie a full refund, the elementary school principal says her schedule means she won't be able to rebook the holiday until next year. 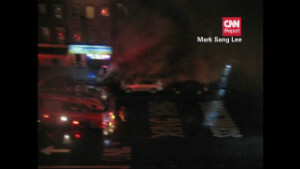 "I feel really horrible for those poor people in New York at the moment. It's disappointing to lose our holiday, but for them it's a much more hideous situation," she told CNN. Qatar Airways and the United Arab Emirates-based airlines Etihad and Emirates also canceled flights to the U.S. northeast. In a statement Emirates said the safety of their passengers "will not be compromised." Air France, Germany's Lufthansa, Ireland's Aer Lingus and Turkish Airlines have also scrubbed flights in and out of New York. 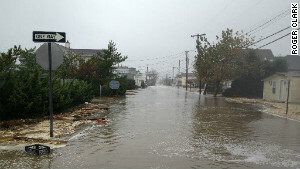 Some 50 million people from Virginia to Massachusetts are expected to feel the effect of Sandy, which made landfall in New Jersey late Monday. The cost of potential wind damage alone could be up to $3 billion, according to the Federal Emergency Management Agency. The storm has also prompted thousands of domestic flight cancellations across America. While all American Airlines flights to the east coast are canceled, the airline is operating a normal service to other parts of the country. United Airlines grounded roughly 3,700 flights between Sunday and Wednesday, and Delta said all flights from Washington to Boston, and out of New York and Philadelphia, were canceled. Both companies are allowing some customers to change their flight plans without paying any fees due to the storm. So how long will it take for airlines to get stranded passengers to their destinations once the hurricane subsides? Not long, according to CNN's Richard Quest, who said the problem should start being resolved from Wednesday. "All the airlines have exceptionally sophisticated recovery programs," he explained. "What they do is they don't make the flight to the first place. They don't send the aircraft into the bad areas, so they don't get stranded. They're now already starting to work out flights for Wednesday, Thursday and Friday. You write off Monday and Tuesday, then you start to rebuild the schedule." "After the [Icelandic volcanic] ash cloud two years ago, airlines were able to restore the schedule quite quickly, simply because people canceled their flights [and didn't rebook]. And that's what the airlines are banking on. "I'm guessing that by the weekend everyone [will have] got where they need to be." Information from CNN Wires was used in this report.